In spite of the fact that after joining the Schengen Area the Russians need visa to visit Malta, it didn’t influence its popularity among the Russian travellers. Malta is still one of the most favourite resorts in the world. Malta has wonderful climate, long summer, and transparent sea. Besides, there are quite affordable language schools here. It is also a very safe country, as its crime rate is one of the lowest in Europe. Here the tourists enjoy variety of entertainments and splendid cuisine. 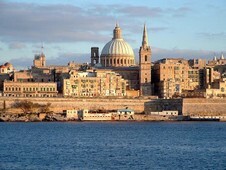 Historical and cultural monuments can be seen throughout Malta. Don’t hesitate to visit this country. In case you decide to travel a lot within the island, visit different cities and don’t want to be limited in movement, it’s better to rent a car. On the bookingcar.ru website you can book a car right now at a good price. A car can be also delivered to the airport of Malta to your arriving. To give a fine, policemen don’t need to come to the driver by their own. A fine, for example, for wrong parking can be fixed to the windscreen. It must be paid during a week; otherwise, a violator can be demanded to court. We recommend you to learn the driving regulations of Malta in advance to make your trip around the country by a rented car really pleasurable. It's necessary to observe the speed limit. Its violation is strictly controlled and punished with fines. In some sections of the roads general rules are not valid, there are special restrictions to be observed. Legal blood alcohol concentration allowed is 0.8 ‰. Remember that even minimum exceeding of this concentration is penalized with € 1,200 fine. Additionally, drivers can be taken into police custody for up to 3 months. The driver's license is likely to be confiscated for more than 6 months. To avoid such consequences, pay attention to the amount of alcohol drunk or better even don't drink alcohol before driving. Note some driving regulations, which must be observed while travelling in Malta by a rented car. For example, you must turn on the low beam while driving through the tunnels. Children aged to 10 must go in child safety seats or held by a special device. All passengers must be buckled up. It is prohibited to use a cell phone while driving.